Amelia Earhart was a woman of many "firsts." In 1932, she became the first woman to fly solo across the Atlantic Ocean. In 1935, she also became the first woman to fly across the Pacific. From her early years to her mysterious 1937 disappearance while attempting a flight around the world, readers will find Amelia Earhart's life a fascinating story. Kate Jerome is an award-winning children's book author and a lifelong advocate of science literacy. She has recently completed a Fellowship at Stanford University and, in addition to writing new children's books, she is now developing innovative programming in virtual reality. 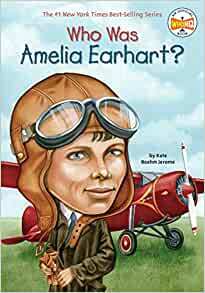 Start reading Who Was Amelia Earhart? (Who Was?) on your Kindle in under a minute. 5.0 out of 5 starsStudents love this nonfiction series for AR with book levels from 4.5-6.0 and worth 1 point. My students are in a 5th and 6th grade gifted class and all really enjoy the entire series of "Who Was?" "Who Is?" and "What Was?" books for their AR (Accelerated Reader) goals. These series are all classified as nonfiction, with book level from 4.5-6.0 and they are worth 1 point. My 7 & 9 year old love this who was series. Very informative kids, not to kiddy. Kids love these and parents too. Kids love to share what they have recently learned and with ears opened parents can learn just as much as the kids! Had to buy this book to get my daughter introduced to this amazing pilot woman, Especially after we started figure skating classes at Aviator Sports(abandoned hangar redesigned to be multiple sports complex), with a huge photograph of Amelia Earhart on the wall. P.S. we also needed to read more for school book club. Great book. It's good for second grade. ( or i say 1 - 3 grade) my daughter got it for her school book report, and she is third grade. She finished the entire book quickly within a day and it's very easy for her to understand the story and the history. 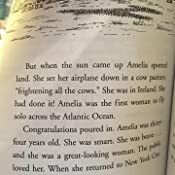 My daughter finished this book and said I LOVE AMELIA EARHART. Very informative and entertaining with plenty of good pictures. 5.0 out of 5 starsWho is Series? My 8 year old is really onto this series right now so grandparents purchased a lot of them for her birthday. She's read quite a few of them already and we have enjoyed hearing her "teach" us the new information. This was a great little book for my 5th grader to do a small report. Had more than enough info and nicely animated. I intend to buy more in the series. This item: Who Was Amelia Earhart?